This is Kim's hubby, my youngest brother, Mark. He is sporting his Dirty Santa gift. And Lori calls claim to this man, my oldest brother, Ray. 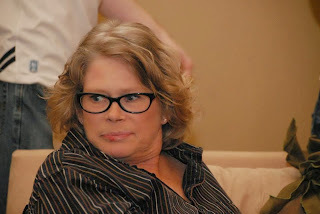 My mom looking over the fun. This is my nephew, Chase and this is the standard family picture look! See, standard picture look gets right on going down the line. My nephew, Cobi and niece, Holly. Holly, the drama queen that makes our life full of laughs. 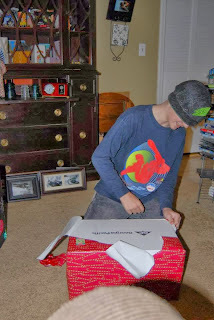 My middle grandson, opening a gift. And my oldest grandson playing with his gift. But here he is trying to hide from Nana's camera. Youngest grandson, Braden, chasing Dudley the cat under the tree. Nephew Sean playing dart guns with Caleb. A couple of weeks ago I did a quick photo session for my niece and nephew. They wanted pics for Christmas gifts. I thought we did an amazing job being that it was in the low 30's and this photographer was SHAKING! I have found buying for a 13 year old boy is not easy. And I decided to make Christmas easier this yr and just get each boy a one or two things. For Caleb he loves games for his Xbox. Usually he beats one and trades it in for something new. So he got a Game Stop gift card. Boxed and wrapped in 7 boxes. DJ checking out his bag of goodies. Braden checking out his bag. 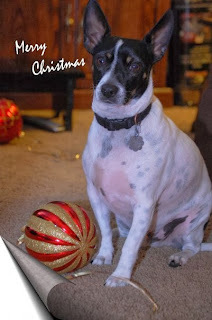 Dakota AKA The KING is a RAT Terrier. He was named justly so since he was breed to hunt rats, and critters such as them....like a squirrel. Now keep in mind that The KING has put on some weight and so he does not run near fast enough to catch the squirrel before they run up the tree. 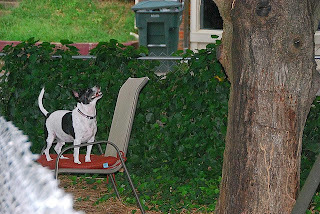 But, Dakota thinks the use of a lawn chair will help him in the aid of catching that said squirrel. He can even sat down on the job! "Hey wait, where are you going? If you move to that tree I can't continue to sat in the chair"!! This shot was taken several years ago of Dakota AKA THE KING! Look at that royal sit!! Taken last year and he was not happy about mom playing around with him. Granny had Dakota a gift... TREATS but I made him go after them. Taken 2 years ago by my nephew Chase. This is his son, my great nephew and I at Opryland Hotel looking at lights. I have reduced the amount of stuff I put out at Christmas since it is just me and I have even reduced the size of my tree. Got this one last year to replace the fat, thick wide one I have.